I told you them guys was really hot! EKK on Kauai 2013. I told you them guys was really hot! Mahalo again for Having Hiikua at EKK we had a great time. Please forward this to those at EKK who you have emails for. Also I forgot to mention that people can follow Hiikua on Facebook all they have to do is search Hiikua music and “like” it and they can be kept up to date as to where we are performing. wHAT A WONDERFUL PROGRAM TONIGHT with such a talented group!! Their harmony was exquisite, their instrumentation impeccable and their banter was just hilarious!!! Great job. Looking forward to seeing my old friend Jerry Santos next week. Mahalo. Once again thankyou for agreat evening. ALOOOOHA – FROM LARRY MAYSON IN CANADA. ONE OF THE BEST DAYS OF MY LIFE – MAHALO AGAIN. From the first strains of their remarkable harmony until the last strum of the guitar, the group Hi’ikua thrilled and mesmerized the audience with that special quality that makes it work them so memorable. Kamuela Kimokeo whose musical excellence as a teacher and a performer is rock solid and exciting at the same time; Kalehua Krug is startling at first sight with half his body tattooed from the top of his bald head to his pinky toes but when his beautiful falsetto voice pours out, he appears angelic; and Blake Leoki-Haili rounding out the three with the lower register just became a father. Leading off with a Kaua’i song, Nani Kaua’i, that showed off Kalehua’s clear and beautiful falsetto and Kamuela’s pa’ani on the slack key, they packed the first hour with songs written by Kalehua, old favorites with their original twist, and very special numbers such as the instrumental Night Riders in the Sky which brought the audience to their feet and Maunaloa Slack Key Live often called the Poi Song. Kamuela describes Kalehua’s ability to compose songs “like crazy . . . very naturally” and that his songs can be dated by the lyrics. A Little Bit of Sweetness is a song that he wrote in high school, but when they sang it, the simple lyrics and zesty melody was recognizable as a song that we hear often. Ka’ena Medley is another zesty song whereas Tutu Aloha is an exquisite harmony about his grandmother who is metaphorically the Apapane bird, He Aloha No ‘O Halawa about the different winds on Molokai is a very complex song which he chose to teach the ‘ukulele circle. He chose that song so he could share with them the musical concept that would allow them to move from one chord structure to another and be free to play whatever they wanted. I listened in and wished that I was a bit more ‘ukulele akamai to be able to appreciate his wonderful teaching skills. Hi’ikua puts their own special twist on well known songs like Koke’e by Dennis Kamakahi and Ka Pili Oha by Hui O Hana. Kamuela says that anything Hui O Hana touches is “gold” so they hesitated about singing this song about lasting friendship. 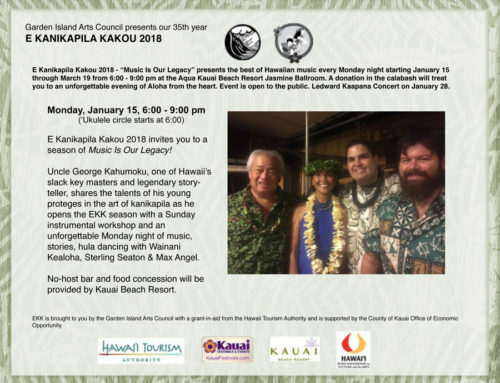 But they did anyway and their version was memorable as was every song they sang — E Ku’u Morning Dew by Larry Kimura and Eddie Kamae, Maddy Lam’s Pua Ahihi to honor the musicians that came before them and He Aloha Makamae. Kamuela mentioned the Harlem Globe Trotters and Sweet Georgia Brown which turned out to be Jus’ Press made famous by Ledward Kaapana; Kamuela brought the house down with his rendition as he played his guitar with the mic stand, with his shoes, with his socked foot, with his elbows, with his dark glasses, with his teeth and with his palm on the fret board; he said his wife got mad at him for cracking his tooth on this song. Ku’u Hoa Hi’ikua is their signature song which was written by Kalehua at a time when his father was dying of cancer. What a beautiful way to wrap up an evening of the best of Hawaiian music. There are only four more Mondays left so don’t be left out in the cold; hele on to the Kauai Beach Resort to experience the celebration of Thirty Years of EKK!! !